Getting a good deal on a used car is always a tricky business. Used car salesmen have a reputation for turning on the charm and using all sorts of sales techniques to persuade customers to buy the most run down banger for a top notch price – not exactly the kind of deal we want you to come away with! 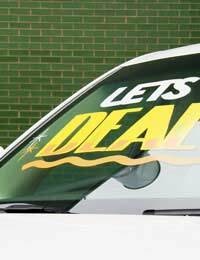 To blag a used car you will need to outblag a blagger, which will no doubt take a lot of time, persistence and resilience. You will need to blast sales techniques to ensure a decent negotiation on price by following the tips below. To further increase your overall savings check out the car financing methods also detailed. If you follow all of the following tips, you’ll definitely end up blagging a killer deal! Once you have entered a showroom, salesmen will usually begin negotiations by lowering your expectations. They do this by showing you a car that doesn’t suit your style and needs at all and has a higher than usual price tag. Once they see that you are dismayed that such a poor quality car is so expensive they will ask you to describe exactly what you are after, and show you something very similar to your expectations at a lower price than the original car. Compared to the first car you will be impressed in terms of value and style; which is exactly what the salesman is after as you’ll likely to be making quick comparisons, and decisions on making a purchase! Blaggers should ALWAYS take their time when shopping for used cars and visit more than one garage. You need to compare vehicles across a wide range of dealerships and not at just one, to ensure you have an accurate gauge in your mind of realistic current prices. When a salesman tries to wow you with a “special price” or “special deal” tell him that you’ve seen similar cars on the market for less, and prove yourself right by listing similar cars in nearby showrooms. Although you’re unlikely to be that salesman’s favourite customer, you might get across the point that you’re not going to pay more than you should for anything, and consequently blag a deal! By adding pressure and time constraints, salesmen often produce quick sales from customers not used to this kind of sales environment. If a salesman starts telling you about other customers who are interested in the car you like, or that the “special” price tag will go up next week, keep calm. These are probably either exaggerations or mistruths. Even if other customers do buy a car when you don’t, it is better to spend a few more days looking for the perfect model than to jump in a pay over the odds for a car you are eventually unsatisfied with. If you play hard to get and don’t concede to a pushy salesman’s advances he may very well follow you as you leave a showroom to think things through, and offer you a knock down price. Be hard nosed and prepared to leave any sale and move on. This will give you the upper hand in most negotiations. Beware of flattery and false compliments. Salesmen know exactly how to treat you well and charm you into making a purchase. Remember that salesmen do not really like you, but they do like the money you provide them with. Try not to pay attention to sales small talk. You need the upper hand in negotiations so try to lead conversations, interrupt the other party, maintain eye contact and ignore needless charm! Once you have outsold your salesman you’ll need to think about your finances. If you can afford to buy a car outright, good for you. If you can’t, consider a Personal Contract Purchase (PCP), which is a new method of car financing that avoids the depreciation trap and can be cheaper than repaying a loan. However it is not cheaper for everyone and it is certainly worth researching both loans and PCP contracts side by side to ensure you get the best deal. A PCP agreement allows you the option to set up a contract term, with monthly payments. At the end of the term, you then have the option to purchase the vehicle outright, or simply hand it back to the contract provider. A PCP is a standard contract wherever you go. As long as the company providing you cover is regulated by the CCA you know you’ll be safe when you enter into the agreement and like all financial obligations, it’s nice to feel safe! Do your research and make sure you always get several quotes before making a purchase. If you do that, blag a used car for a very good price!